It’s August. Washington, D.C. is warm and muggy. Congress is out of session. Things are quiet. It’s as good a time as any to check in on several issues we’ve been following here at the Society, particularly with NASA’s budget prospects for the year and the future of human spaceflight policy. For audiophiles: you can get a deep dive into these topics by listening to an extra edition of Planetary Radio this week, which featuring an extended interview with me by Mat Kaplan. It’s pretty good. Congress needs to pass a budget for the U.S. government by October 1st. Right now, the House of Representatives has passed multiple bills for different areas of the government (including one for NASA). The Senate has passed none, though several are effectively ready to go up for a vote. The Senate would need to pass its bills, work out differences between them and the House, then both chambers would have to vote again. Adding to the mix, the White House has issued veto threats for every funding bill since they all adhere to sequestration-level spending reductions. There is not much time to sort this out before October, meaning we face another possible government shutdown. Add to that a debt limit vote, a needed extension to the federal Highway Trust Fund, and multiple presidential candidates in the Senate competing for primary voters, and you get what Politico calls the “fall from Hell.” NASA will be along for the ride. If you asked me to guess, I would bet we ultimately end up a full year continuing resolution—basically an extension of last year’s budget. But if that’s the case, sequestration would still kick in and apply across-the-board cuts to nearly every federal agency. There’s a chance that we could have a temporary extension, followed by a single massive bill sometime down the road. That’s what’s happened the past few years. Whatever happens, we’ve seen some details of what NASA’s budget could look like going forward. Overall, NASA did very well considering the spending limits adhered to by both the Senate and House. Remember, both the Opportunity Rover and the Lunar Reconnaissance Orbiter are zeroed out in the President’s budget for 2016. The House’s bill would restore that funding. The Senate makes no mention of them or where their $40 million cut to Planetary Science would be applied. My guess is that the Senate’s cut is more of a negotiating tactic with the House, which proposed a significant increase above the President’s request (finally reaching our recommendation of at least $1.5 billion per year). A Europa Mission will likely receive funding in 2016 no matter what happens. That mission has entered Phase A, which basically means formal development has begun. The science team has been selected and met for the first time in early August. There is a long way yet to go before we get this spacecraft off the ground. No one even knows yet when the mission will launch, as that heavily depends of how much funding is available at these early stages of development. 2022 would probably be the earliest it could launch, though NASA officially says its planning for sometime in the mid-to-late 2020s. We expect to release the report from our early April workshop in September (just in time for the release of The Martian!). 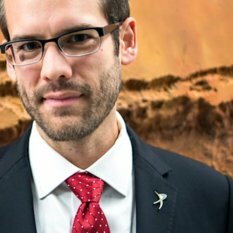 In the meantime, the JPL study team behind the orbit-first concept to send humans to Mars published a peer-reviewed paper in the latest issue of the New Space Journal. You can also watch an extended presentation of their concept from the 2015 Humans to Mars conference back in May. After describing the orbit-first approach in our Summer issue of The Planetary Report I asked for feedback on the idea from our members. It must have touched a nerve, since I’ve received more emails from Society members about this than any other topic, ever. I’m reading them all and trying (and failing) to respond in a timely manner. We will reprint excerpts from them in the next issue, but overall the response has been very positive. I’ve valued the feedback. Last week I was in Washington, D.C. where I debated the value of this sustainable, stepwise approach to human exploration over the (significantly) more ambitious Mars Direct concept, and why Mars should be the goal over an extended lunar presence. Representing Mars Direct, of course, was Dr. Robert Zubrin of the Mars Society. Representing the Moon was Dr. Harrison Schmitt, of Apollo 17. 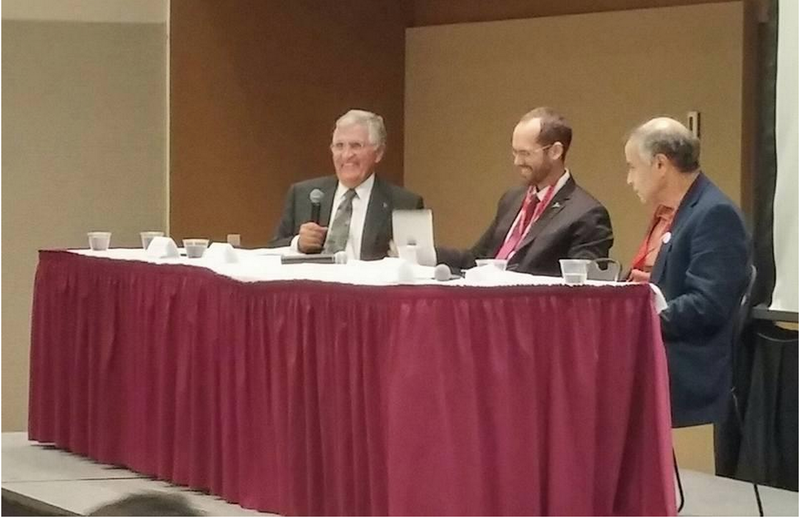 Dr. Harrison “Jack” Schmitt, Casey Dreier, and Robert Zubrin debating the future of human spaceflight at the 2015 Mars Society convention. After the wildly successful flyby of Pluto, we asked you to start writing Congress (or the White House if you are outside of the U.S.) in support of NASA and planetary exploration. So far, we’ve had over 19,000 people send roughly 76,000 messages to Congress asking them to fund planetary exploration at NASA. That may be a record for us (I’m looking into this). We’re also in the middle of our annual fundraising drive for the Advocacy program. Our goal is $100,000 and we’re 85% of the way there, which is great. We’re testing the idea that members of the public are willing to support a team of people who represents their passion for space exploration. We’ve got our work cut out for us.